Now with a Choice!! Digital Print playfields in stock, ready to ship NOW. The same process as other playfield makers. You may proceed below. 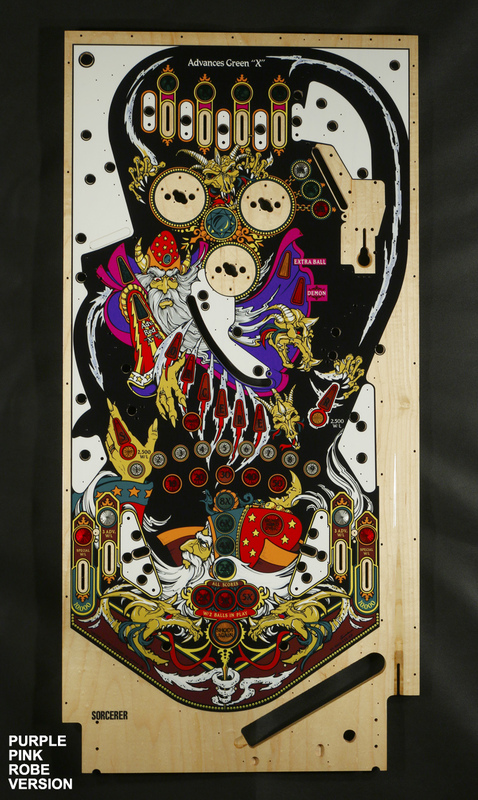 -OR- If you want the genuine CPR silkscreened playfield for Sorcerer, the run hits the press in 3-4 weeks, printing for 1 week, then away to clearcoating across 1-3 weeks. You can lock in your ‘Silkscreened slot’ with the Cart and Checkout below – a $100 deposit. Optional Sorcerer Plastics (playfield-combo discounted!) or optional Sorcerer Toppers (playfield-combo discounted!) 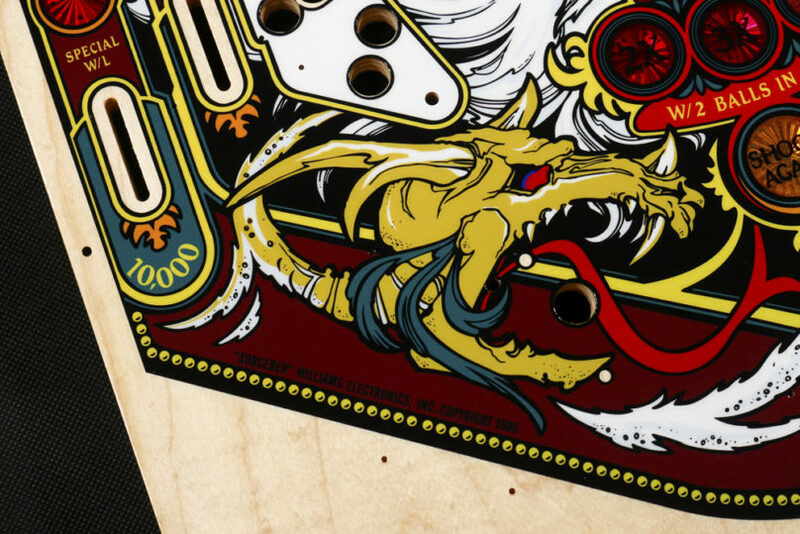 are available to any Sorcerer playfield customers, if you want to add them to your shipment. For Silkscreened version customers with their $100 deposit in, when shipping time comes, you will get a PayPal invoice for your balance. All the Silkscreen versions we will ship will be Gold graded @ $729 So your balance will be $629 at shipping time (you already had $100 down). 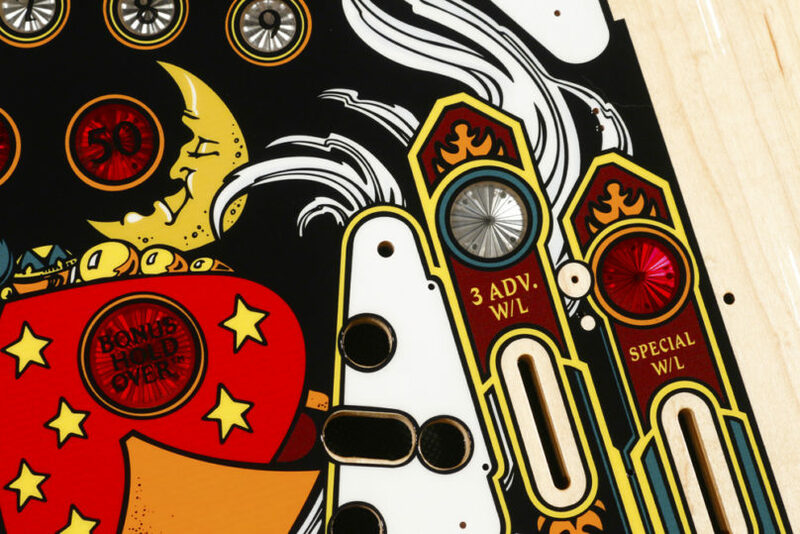 For Digital Printed version customers, you have a choice of two historical variations of the playfield. The Purple/Pink robe version (most common), or the more rare Blue/Red robe version. Your choice. See Grading Explanations at the bottom of the page, including the new Digital Print description. 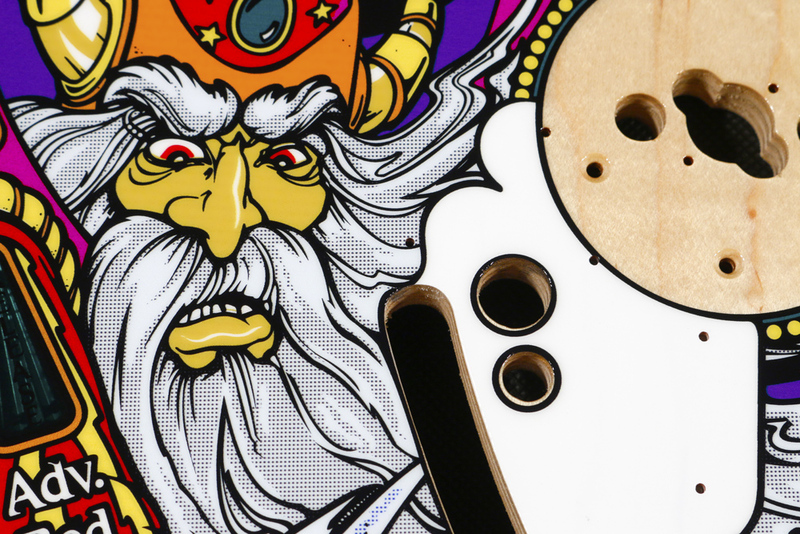 THIS PAGE USES OUR NEW PLAYFIELD SHIPMENT CONFIGURATION TOOL – If you want the Sorcerer Plastics, or Sorcerer topper, they are offered at deep discounts if taken in your playfield(s) shipment. Save on shipping, and take advantage of bundle discounts, compared to buying & shipping separately later on. Adding plastics or toppers are completely optional. If you don’t want them, skip through those steps. DIGITAL PRINTED. Our Digital Print candidates are the first, early-bird option out of the gates. Available for immediate shipping weeks/months before the complex silkscreen printing of our entire run gets completed. These are available for those who don’t want to wait – and can be purchased without waiting for the rest of the run to catch up. Upon ordering, you will get one of the digital-printed candidates we do in small batches, ready to purchase and ship. There is no “grading” of the digital printed playfields, as each and every print is consistent and comes out flawless. 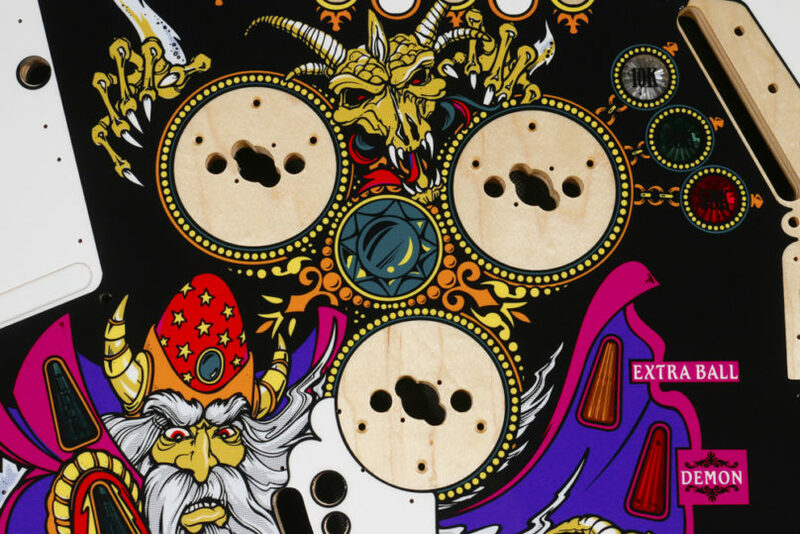 Just remember, while digital prints look great – they are made from CMYK Process (dots), and not individual spot-color hand-mixed inks, which would normally be silkscreened down individually, over a week of separate press shifts. When digital printed colors are inspected extremely up close, some colors will display a fine granularity/graininess. These versions of our playfields will be on par with competitors’ digital print playfield quality, and fall under the “One single grade, all top quality” mantra. 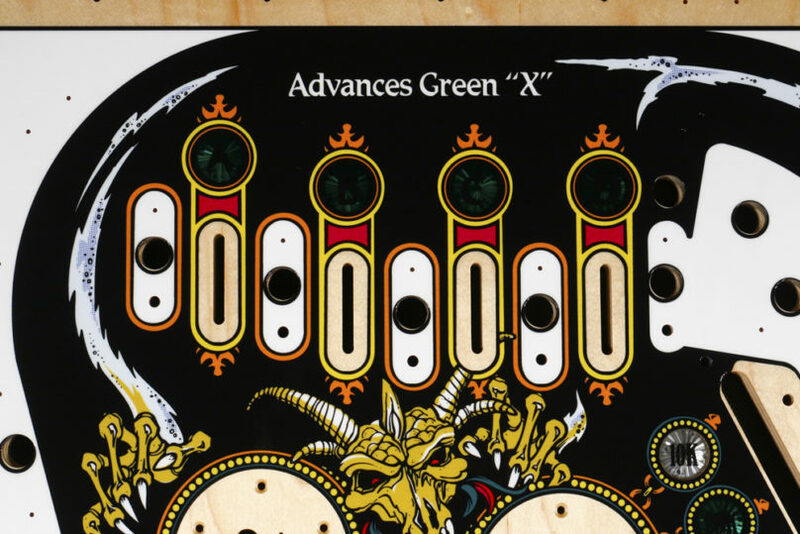 If you are seeking the absolute best solid Pantone color rendition and OEM originality – then go for CPR’s Gold, Silver, or Bronze SILKSCREENED playfield versions – the most superior playfield artwork in the hobby, no corners cut. Yield: All digital prints are ‘flawless’ quality. One grade. One quality. GENUINE INK SILKSCREENED. Our Gold Class candidates are the best playfields we have to offer. These playfields are exactly what you have come to expect from us for the last 7 years. 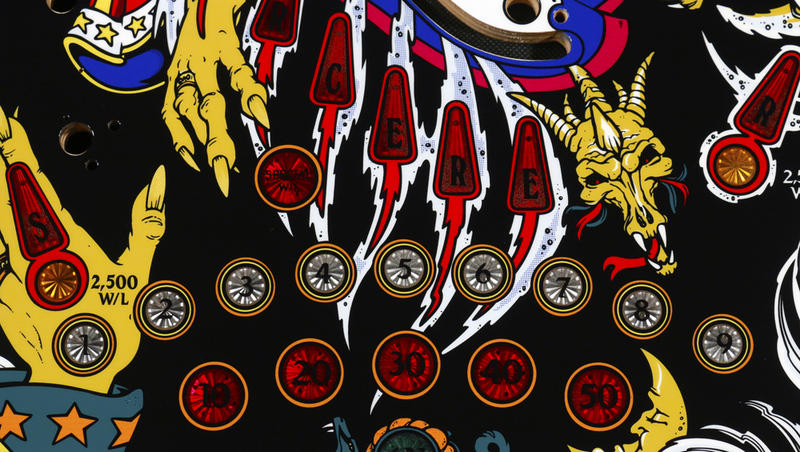 Is every playfield absolutely 100.000% perfect?? No. 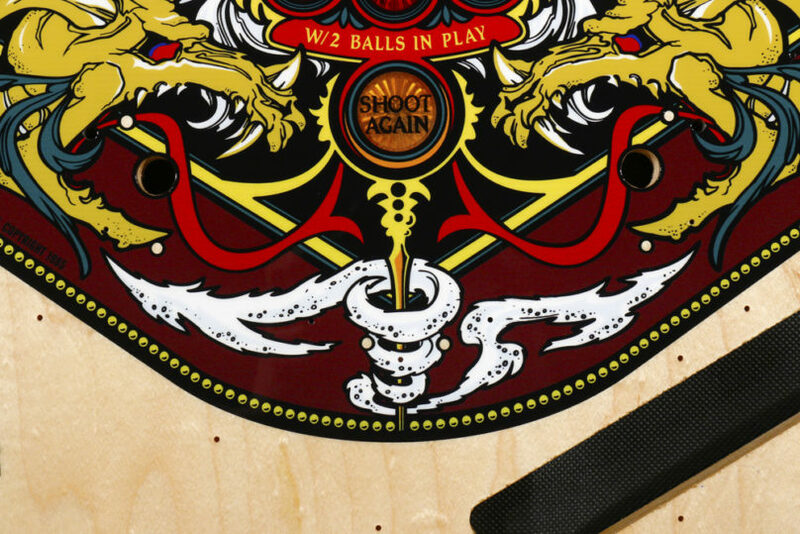 No playfield ever is. However, any CPR playfields that get the Gold Class status will be as close to “perfect” as anybody has ever been capable. These are our best. They are also typically the first to be sold out, with Silver and Bronze being the alternatives afterward. GENUINE INK SILKSCREENED. 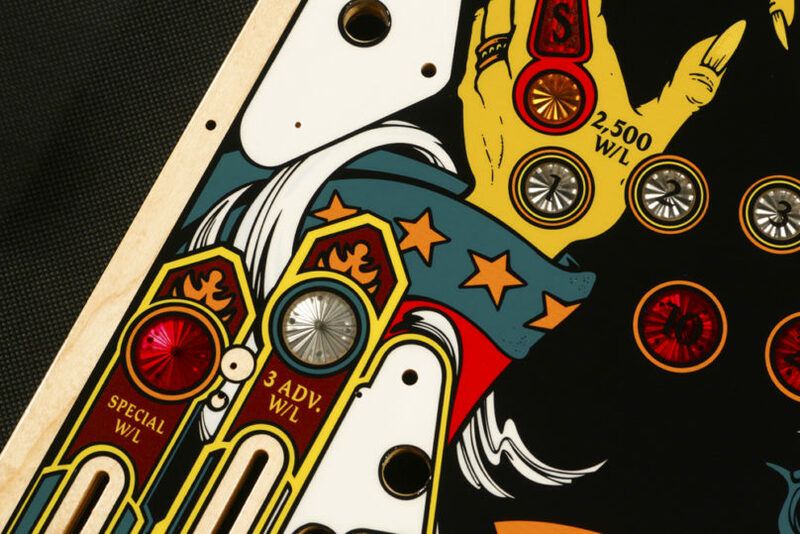 Our Silver Standard candidates meet or exceed NOS “industry quality” from the original playfield factories of yesteryear. NOS playfields were never perfect, and in some cases not even close to perfect. So these are still better than remaining (usually pricey) NOS offerings out there. Our Silver Standard candidates will still retain the beauty that is customary in our CPR Gold playfields, but some NOS qualities will also be present. 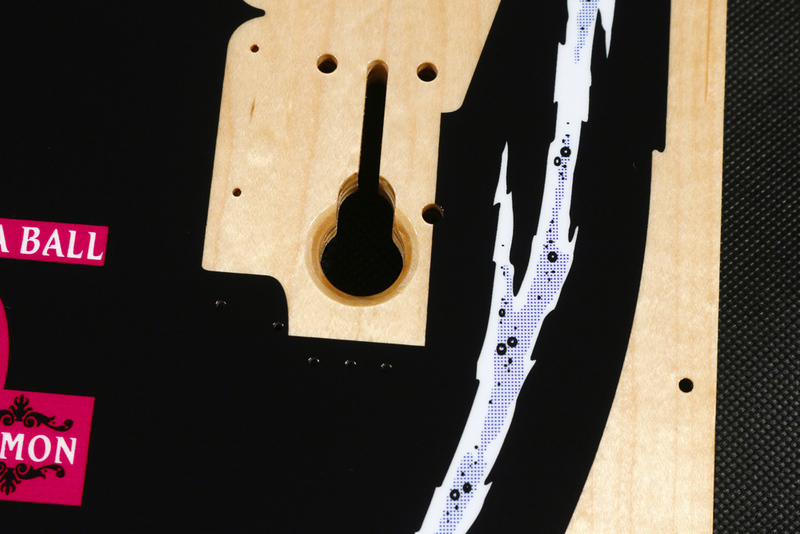 These may include very small misalignments, very small marks in the artwork, or the occasional insert being imperfect. Allowances that would be typically encountered on any factory NOS playfield, even ones made by professional factories today for Stern. These are the best available once the Golds sell out. Pricing: Sold at slight discount. These are the ones people buy when Golds are sold out. GENUINE INK SILKSCREENED. Our Bronze Grade candidates are set aside for not achieving the level of our Silver Standard. 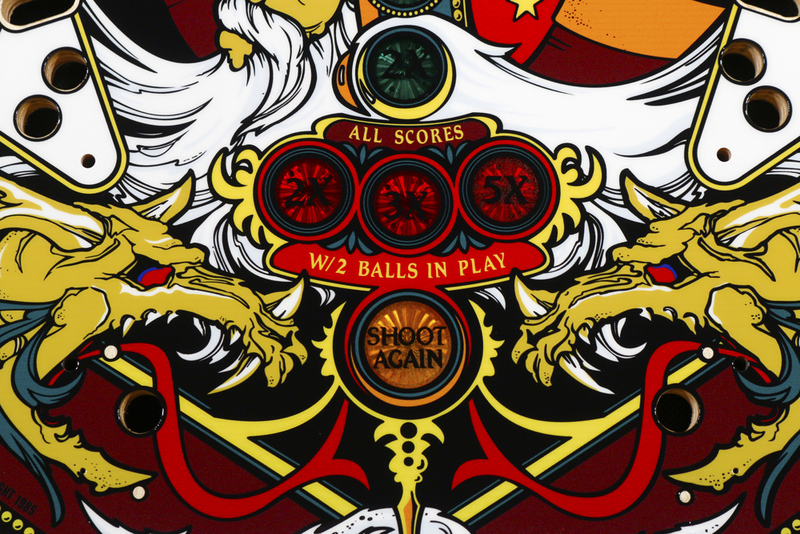 These playfields will have issues that are more obvious, unique, and thus will vary individually from playfield to playfield. Considered the “blemished” from the run. 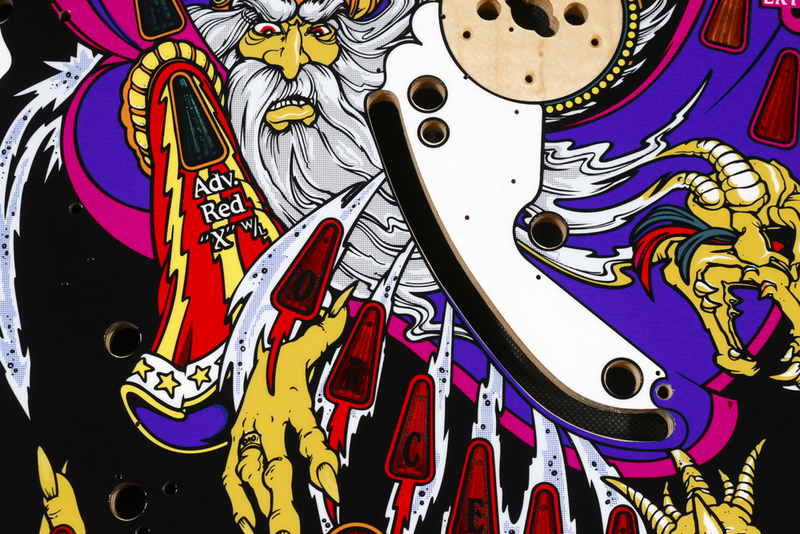 For some customers, they won’t care, because these candidates will almost always be vastly better than ANY playfield your are likely to encounter in a 20-30 year old game. Bronze playfields are always a great option for the more budget-conscious. Pricing: Sold with deeper discount.